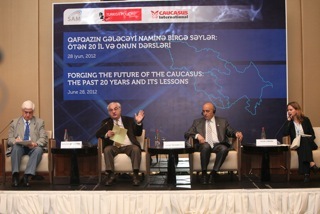 "Forging the Future of the Caucasus"
On 28 June 2012, Turkish Policy Quarterly (TPQ), the Baku based Center for Strategic Studies (SAM), and Caucasus International jointly organized a conference entitled "Forging the future of the Caucasus - the past 20 years and its lessons" in Baku. The event was chaired by TPQ editor-in-chief Nigar Goksel, and began with brief welcoming remarks by director of SAM, Farhad Mammadov, publisher of TPQ, Kemal Koprulu, and editor-in-chief of Caucasus International, Zaur Shiriyev. 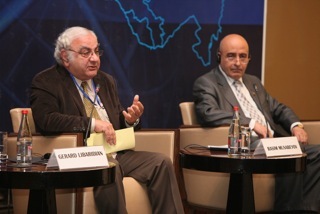 Subsequently, perspectives were shared by the panelists, Gerard Libaridian – historian and formerly (1991-1997) senior advisor of the first president of Armenia, Alexander Rondeli – president of the Georgian Foundation of Strategic and International Studies, and Rasim Musabeyov – Member of Parliament of Azerbaijan. The speakers – each of whom are prominent scholars with experience in decision making, shared their insights about the expectations of independence in the Caucasus, and the lessons learned over the years. Dr. Rondeli started by pointing out that they had thought everything would be easy after independence was obtained, but in fact dealing with ethnic nationalism and transition to democracy and market economy proved very difficult in practice. Georgia had no strategic culture either, he noted. Though notions such as nation building and state building were known in theory, how to actually do it was not, he pointed out. As for Georgia's strategic positioning, Rondeli admitted that chosing the West as Georgia's orientation had been dangerous, however, there is no other way to achieve what Georgians need in terms of governance and development. 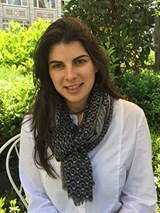 Dr. Libaridian pointed out that the expectation was that the Cold War would end with the dissolution of the Soviet Union, whereas it did not end in the South Caucasus. Describing his perspective of the judgement flaws of all three republics, Professor Libaridian underlined that looking for solutions from Brussels, Washington or Moscow was one of them. 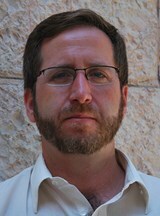 Instead, he pointed out, the people need to take responsibility, and try to find solutions in dialogue with each other. Different domestic political actors have invited foreign powers in when they think this can serve their country's interests as well as their domestic political rivalries. 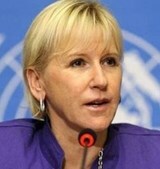 Whereas, sometimes, the foreign powers involvement makes reaching solutions even more difficult, he noted. Libaridian shared his opinion that the Karabakh conflict is the biggest obstacle to the development of the Caucasus because, unlike in the Georgian case, it involves two of the three countries of the Caucasus. Political scientist and Member of Parliament of Azerbaijan Rasim Musabeyov noted that there had been doubts about the sustainability of Azerbaijan's independence and sovereignty, but today, it is no longer questioned. Underlining this and other achievements of Azerbaijan, he pointed out Azerbaijan's orientation to the West – also on the basis of opinion polls in which Azerbaijanis express preference for Europe over Russia. The people do not want to sacrifice their independence, he stated. Dr. Musabeyov opined that while Azerbaijan and Georgia are oriented to Europe Armenia remains more indexed to Russia. For the Caucasus to be a "region" – besides geographic location, all three of the countries need to chose the same orientation, he concluded. All three speakers agreed that politically and economically the three Republics are not functioning as a 'region,' and pointed out the importance of regional integration and cooperation - and the importance of overcoming the conflicts to achieve this. In the question and answer session, a lively debate ensued. 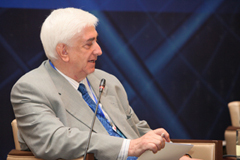 Vafa Guluzade, who was advisor to the President of Azerbaijan throughout the 90s, said that Russia had not allowed the establishment of peace, stability or development in the Caucasus during the past 20 years. Please click here to read the analysis of this Conference.